Aim: The purpose of this study was determining causal relationships and modeling structural equations of relationships between quality of work life, psychological empowerment and employees' productivity of Municipal Administration of Zahedan. Methods: The method of the study is descriptive-causal - correlative. Statistical population of the study included administrative employees in municipality of center, district 1, 2, 3 of Zahedan in number of 257 people. Result: Findings of the study showed that the relationship of each variable, quality of work life and psychological empowerment, and employees' productivity and also relationship between quality of work life and psychological empowerment were significant (P ≥ 0.01). Discussion: Findings related to structural equations model showed that quality of work life had a direct effect on boosting employees' productivity, but its indirect effect on employees' productivity was more than its direct one which has played this role by boosting employees' psychological empowerment as an intermediate variable. Psychological empowerment also influences on employees' productivity. Today's world, on one hand, is the world of evolutions and transformations, a world full of changes, changes are not completely but are created as the result of people's demands and determinations. Demands that result from different and extended needs of people complicated nature. In this age, these changes and transformations constantly create threats and opportunities for different organizations. In the meantime, organizations are successful, which adjust themselves with the resulting conditions and changes. Organizations whose employees constantly increase their abilities to gain desired results can do such Skillful and expert manpower training is the most important factor in any organization success facing with environmental changes and this is the human who can utilize tools and facilities to achieve organizations' objectives and that is the productivity in workplace. Productivity is one of the factors which guarantees the durability and performance of organizations in today's world of highly competitive. Price recycling × productivity = profitability. Since the key factor in productivity in organizations, and at the most, in the society is manpower, undoubtedly every society's progress is closely connected to improving and nurturing the human resources. And by this reason, head of organizations supporting by experts of behavioral science and human resources pay careful attention to nurturing of the employees. In the empowerment, we are not just dealing with motivational issues, but it will influence on manger`s performance and effectiveness. And employees' impact and productivity. Creating psychological empowerment in employees demands some conditions and principles in an organization. One of these conditions is grounds for quality of work life in organization. Quality of work life is a process by which all members of the organization are involved in all decision, which is particularly made on their job and generally made on their workplace environment through means of communication and as a result they develop more cooperation and satisfaction. Furthermore, they feel less workplace stress. Quality of work life is the degree at which employees feel comfortable and enjoy their work life. This degree points to the desired situation, which is in an organization. By work situation we mean satisfaction, motivation, cooperation and commitment of people in work regarding their life. In fact, it means a degree at which people are able to satisfy their needs while they're working in an organization. If work life is viewed from instrumental perspective one could say the quality of work life is one of the major instruments for increasing the social responsibilities of co-workers. Also, quality of work life is one of progress techniques in an organizations which tries to provide trilateral factors of motivation and satisfaction, taking responsibility, and commitment toward work get together and that means quality of work life is one of the progress techniques in an organization, which is applied as important performance of organization through more democratic work place and direct involvement of employees in decision making. Quality of work life will influence on most of the organization's variable, but its main impact in previous studies is productivity. Productivity is the essence of organization's development and cannot merely be achieved through a salary increase, benefits and other facilities. However, satisfaction and increase in quality of work life is a major factor in increasing levels of productivity. High level of productivity and usefulness is a key factor to increase the quality of work life. Patanyak (2005), based on research results, suggests that there is a meaningful and positive correlation between the quality of work life and quality of life. Dolan Sholer assumes a correlation and a meaningful relation among quality of work life plans, productivity and other management activities on employees' affair and human resource such as finding an employee, selection, job analysis, training, growth and planning on manpower sanction and security and work relation. As it is stated, quality of life relates to other employees' work life dimensions. Nonetheless the effect of quality of life on empowerment can be investigated through different dimensions, when employees have a good quality of work life, they will be able to set realistic goals and relate them with organization's objectives. In these conditions, they would share their experiences and would become successful. In addition to a good workplace condition, the potential talent of the employee will be flourished, and they could achieve higher levels of performance. In other words, through quality of work life enhancement we could provide prerequisite and foundation necessary for psychological empowerment. Koberg (1990) also suggested that understanding psychological empowerment will provide an increase in job satisfaction, decrease in leaving a job and productivity. In this respect Fedriko (2004) admits that the goal of quality of work life is application of abilities and capabilities. He declares that the mission of quality of life is to create job satisfaction and productivity for employees and assistance to the organization for selection and confirming, which are key factors in workplace. If empowered employees believe that they have decision control and authority they will try their best to do their job and this will provide productivity in an organization, therefore one of the most important methods to enhance productivity is empowerment in employee. Results gained by Moradain's study (2003) who investigated the effect of quality of work life on employee performance is in line with the mentioned points, since his results showed that every eight factors in quality of work life influence productivity, which means to stress the importance of quality of work life in order to enhance the employee performance. 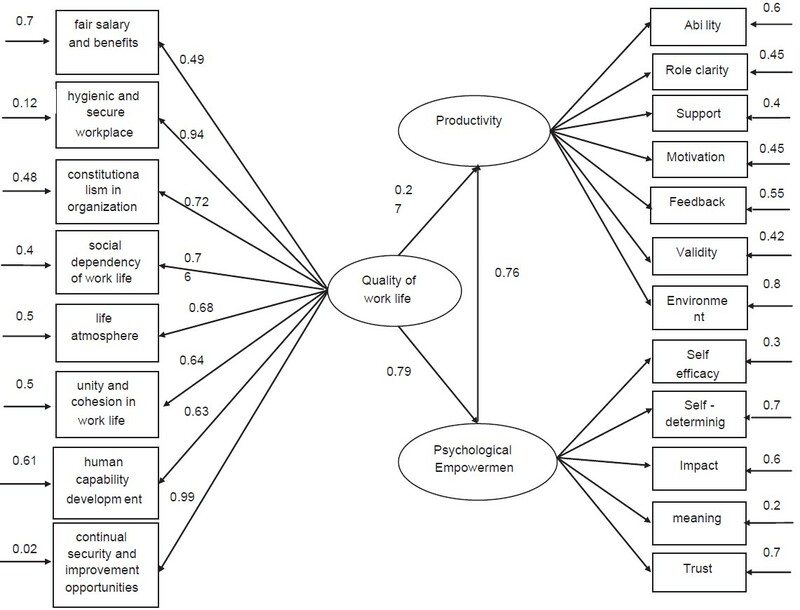 Results by Sozaneh (1997), which investigated the relationship between levels of empowerment and quality of work life also proved that all variables in quality of work life are related to psychological empowerment. Based on what we discussed, the following premises in research theoretical framework are shown in [Figure 1]. Concerning the role and importance of modeling in organizations' progress, the present study aims to investigate the relationship between quality of work life and psychological empowerment in Zahedan municipality's employee based on structural equation modeling. In the present study, a survey methodology of the correlation type is used. Based on the topic and research design it can be called a causal research which is based on the analysis of the relationship among variables and understanding of the causal relation as well. In these relations in addition to finding positive and negative coefficients, the effect of variable on each other, and power and structure of the model based on some of the model indexes through structural equation modeling have been shown. From this population, 155 people were chosen randomly according to the total number which was based on Krejcie and Morgan sample size calculator equation. 155 questionnaires were distributed, and 144 of them were given back and dropout rate was 10%. In order to measure quality of work life, Walton's quality of work life questionnaire was applied. The reliability of the questionnaire was calculated and based on Cronbach's alpha, it was 0.75. In order to measure psychological empowerment, spreitzer (1996) questionnaire was applied. The reliability of the questionnaire was calculated and based on Cronbach's alpha, it was 0.85. In order to measure productivity, Hrsy and Goldsmith (1980) questionnaire was applied. The reliability of the questionnaire was calculated and based on Cronbach's alpha, it was 0.74. In this study, statistics was used in two descriptive (Frequency, percentage and mean) and Inferential levels of Pierson's correlation test, step by step regression and structural equations model to analyze data. Furthermore, all analysis was performed using SPSS 16.5 and Lisrel 8.5 software. There is a relationship between quality of work life, psychological empowerment and employees' productivity of Zahedan Municipal Administration. Pierson's correlation coefficient has been used to answer to the above hypothesis. The results show that there is a positive relationship between the variables of work life, psychological empowerment and employees' productivity of Zahedan Municipal Administration. This correlation value is significant on the alpha level of 0.01. On the other hand, the better staff's work life is, the more psychological empowerment increase within them. Also, the calculated coefficient of determination (r2 = 0.36, r2 = 0.70) shows that 70% of staff's productivity can be explained through the components quality of work life and 36% of staff's productivity can be explained through psychological empowerment. As it is seen from [Table 1], there is a positive and significant relationship between quality of work life, psychological empowerment and staff's productivity. It means that staff's productivity increases by increasing their quality of work life and psychological empowerment. What and how is the causal model between quality of work life and psychological empowerment with productivity of employees? Based on the results from [Table 2]. Quality of work life has a direct effect on psychological empowerment (0.79). Also according to the results, the effect of quality of work life on psychological empowerment is meaningful (t = 9.05). Results from the table also suggest that psychological empowerment has a direct effect on productivity (0.76) and the effect of psychological empowerment on productivity is meaningful (t = 5.82). But based on [Figure 2]. Quality of work life has some effects on productivity through psychological empowerment. And psychological empowerment is a mediator between quality of work life and productivity. In fact, quality of work, life has direct (0.27) and indirect (0.60) effect on productivity through psychological empowerment. Relationship between quality of work life and productivity is meaningful as well (t = 2.62). According to [Table 3] model indexes, show that the model has an acceptable fit. It means Chi-square is the indicator of value 173.56. The other criterion is root mean square error of approximation (RMSEA). And the value < 0.1 is considered as fair and acceptable fit. In this study, the value of RMSEA was 0.017, which indicates fair fit. The other value criterion is χ2 /df and value < 2 implies acceptable model fit and as it is shown this value is 0.1 and indicates fair model fit. This study was designed to investigate the relationship (causal and direct) between quality of work life and psychological empowerment and employees' productivity. Based on our findings from the first hypothesis, a meaningful relationship between quality of work life and employees` productivity was confirmed. In this respect, it can be said that productivity will not achieve merely through salary and benefit and facility increase but productivity is closely connected to providing ground for professional improvement secure and hygienic work condition and acceptance of job as a social responsibility and increase in self-esteem in work place. Based on the fourth hypothesis, among variables under study in regression, the best predictive of employees' productivity are continual opportunity for security and improvement, unity and cohesion in work life, social dependency of work life, capability development and constitutionalism in organization, respectively. Obviously as quality of work life increases, especially through components like continual opportunities for security and improvement, unity and cohesion in workplace, social dependency of work life, capability development and constitutionalism, and if the organizations can make plans to achieve them, by the same token productivity will increase. Moreover, results from the fifth hypotheses indicate that among all variables in the regression, the best predictive of productivity is impact, trust, meaning, and self-determining, respectively. Generally findings prove that conceptual model fits data in an acceptable way so that quality of work life directly has effect on employees' empowerment (0.27) and quality of work life indirectly influences productivity through psychological empowerment (0.60). Psychological empowerment has a direct effect on employees' productivity as well (0.76). The total effect of quality of work life on productivity was (0.87). It can be implied that the direct effect of quality of work life on productivity is less than the indirect and total effect of it on productivity. These findings suggest that in order to increase productivity in organizations, the first priority is to increase quality of work life in organizations, by doing so not only productivity will increase but also psychological empowerment in employees will be provided. And this will be a great help for increasing productivity. Therefore, to have employees' productivity it is necessary to have high quality of work life since employees spend more than one-third of their life in workplace. Productivity will increase providing that high quality of work life be there. Khanalizade R. The relationship between empowerment and organizational learning. Change Manag 2010;2:20-45. Sharifzade F, Mohammadi Moghdam Y. Empowering employees with labor productivity lorestan province police command staff. Secur Manage Stud 2009;4:5-18. Demeter K, Chikan A, Zsolat M. Labour productivity change: Drives, business impact and macroeconomic moderators. J Prod Econ 2011;8:215-23. Ahmadiyan E, Shekari GH. The Relationship Between Psychological Empowerment Applying Agricultural Bank Employee Productivity", in National Conference on Challenges and the Necessity of Administrative Reform in Iran, 2010, Islamic Azad University of Ara; 2010. Darab I. Relationship between productivity efficiency utilization and quality. Work Stud 2000;49:97-103. The current issue and full text archive of this journal. Available from: http://www.emerald-library.com. Alvani M, Ahmadi P. Designing a comprehensive model of factors affecting the productivity of human resources management. Modares 2010;5:19. Torani S, Yazdi V. Empowerment with empowerment perceptions in relation to climate of kerman teaching hospitals. J Health Manag Res 2008;31:17-26. Rehman SH. Employee empowerment through training: A literature review. Gomal Univ J Res 2006;183:33-48. Molhem Y. The antecedents of customer - Contact employees empowerment. Employee Relat 2004;26:332-67. Subrahmanian M, Anjani N. Constructs of quality of work life - A perspective of textile and engineering employees. Asian J Manag Res 2011;1: 229-307. ISSN 2229-3795. Abtahi H, Abesi S. Employee empowerment, management research and training institute affiliated to the ministry of energy. Karaj: Institute for Research and Education Management MGCE; 2007. p. 303. Spreitzer GM. Psychological empowerment in the workplace: Dimensions, measurement, and validation. Acad Manag J 1995;38:1442-65. Spreitzer GM, Doneson. Musings on the past and future of employee empowerment. In: Cummings T, editor. Forthcoming in the Handbook of Organizational Development. 2005. Koberg CS, Boss RW, Senjem JC, Goodman EA. Antecedents and Outcomes of Empowerment: Empirical Evidence From the Healthcare Industry. Group and Organization Management 1999;1:71-91. Shekari N, Lashkarzade KH, Yosefpoormoghadam M. Relationship between quality of work life and performance of the entire prison staff in Tehran. J Educ Reform 2009;45:2-7. Gholami A. Factors affecting the quality of working life in the organization. Hum Dev Mag Police 2009;6:79-100. Thalang W, Boonyarataphun P, Sirasoonthorn P. Quality of work life indicators as a corporate social responsibility of electrical and electronics private organization in Thailand. 4 th Asian Rural Sociology Association (ARSA) International Conference 2010. Rose RC, See BL, Jegak U. An analysis of quality of work life and career related variables science publication. Am J Appl Sci 2006;12:2151-9. Hoseinzade D, Mirzaee S. Quality of working life and its impact on productivity. Management 2007;18:17-22. Mokhtarian F, Mohammadi R, Hossieni S. Impact on Improving the Quality of Working Life of Employees, their Psychological Empowerment. The First National Conference on Human Resources Training Patterns Universities, Islamic Azad University, South Tehran; 2012. Jain P. Preceptions on empowerment and productivity in academic and public libraries in Botswana. Libr Manag 1998;19:49-58. Gal M, Borg V, Gal J. Qualitative and quantitative research methods in psychology and educational sciences, interpreter. In: Nasr AR, editor. Tehran: Publications Beheshti University; 2010. p. 1457. Salamzade Y, Mansory H, Farid D. Relationship between quality of work life productivity martyr Sadoughi hospital nurses. J Urmia Nurs Midwifery 2008;6:60-70. Sabookro M, Vafaie M, Kashani S. Employee productivity and quality of work life insurance companies in the light of emotional intelligence. J Insur Ind 2010;25:179-202. Farniya M, Shojaei KH. Relationship between quality of work life and productivity of managers in the city schools over the plains in the academic year 2008-2009. J Educ Sci 2009;6:161-84. Mahdizadeashrafi A, Ilika H. The relationship between quality of work life and the practice of Islamic Azad University. Firoozkooh Mag Manag 2010;7:1-8. Etebarian A, Salehizade S, Abzari M. Importance of the relationship between psychological empowerment of employees and human resources productivity in government organizations. Eur J Econ Finance Adm Sci 2010;26:44-56. Chang LC. Employee empowerment, innovative behavior and job productivity of public health nurses: A cross-sectional questionnaire survey. Int J Nurs Stud 2008;10:1442-8. Beginia A, Sardari I, Najarinejhad H. Cognitive empowerment of employees to boost productivity of labor. Landsc State Manag 2010;1:79-102. Suzanne A. The Relationship Between the Level of Personnel Empowerment and Quality of Work Life Among Psychological Clubhouse Members and Consumer-perated drop in center Participants. 1997. p. 25-32.